Our entire Onsite - Offshore engagement model is governed by the Simple Services Delivery model (SSDM) to ensure that the Client team and Angulus IT team work closely with each other. Reserving 20% of the sprint capacity time for defect fixing from 2nd sprint onwards. 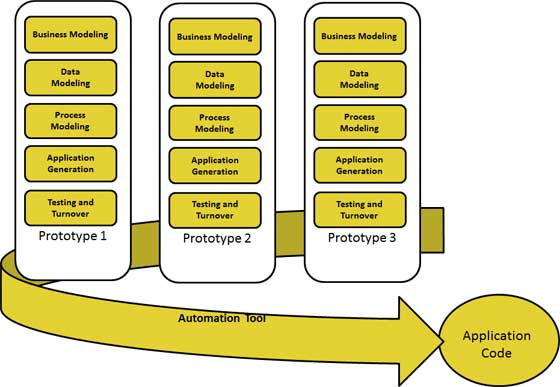 Business Modeling: The business model for the product under development is designed in terms of flow of information and the distribution of information between various business channels. A complete business analysis is performed to find the vital information for business, how it can be obtained, how and when is the information processed and what are the factors driving successful flow of information. Data Modeling: The information gathered in the Business Modeling phase is reviewed and analyzed to form sets of data objects vital for the business. The attributes of all data sets is identified and defined. The relation between these data objects are established and defined in detail in relevance to the business model. 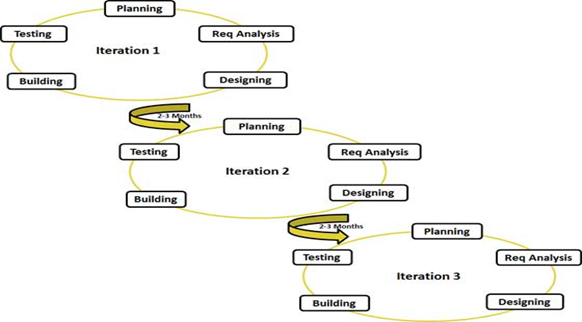 Process Modeling: The data object sets defined in the Data Modeling phase are converted to establish the business information flow needed to achieve specific business objectives as per the business model. The process model for any changes or enhancements to the data object sets is defined in this phase. Process descriptions for adding , deleting, retrieving or modifying a data object are given. Application Generation: The actual system is built and coding is done by using automation tools to convert process and data models into actual prototypes. Testing and Turnover:The overall testing time is reduced in RAD model as the prototypes are independently tested during every iteration. However the data flow and the interfaces between all the components need to be thoroughly tested with complete test coverage. Since most of the programming components have already been tested, it reduces the risk of any major issues. 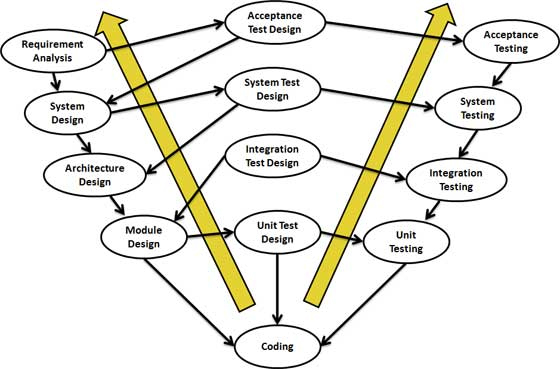 Under V-Model, the corresponding testing phase of the development phase is planned in parallel. So there are Verification phases on one side of the .V. and Validation phases on the other side. Coding phase joins the two sides of the V-Model.